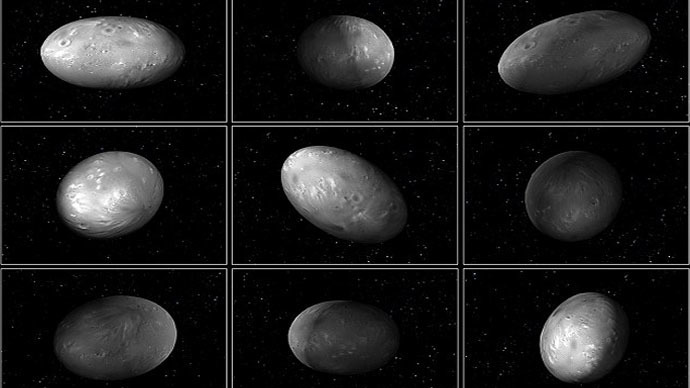 Pluto's outer moons love to dance, but they don't have much rhythm. Instead, they chaotically tumble around the dwarf planet and its largest moon, Charon, according to data from NASA's Hubble telescope. Two of the outer moons, Nix and Hydra, seem to be the life of the party, wobbling unpredictably as they orbit Pluto and Charon. “Imagine for a moment that you’re sitting at the center of the Pluto system and you’re watching Nix as it goes around you...at first it wobbles a little bit...then it flips over. It is essentially an unpredictable situation,” astronomer Mark Showalter of the SETI Institute, one of the authors of the study, told reporters. The moons' celestial shenanigans are detailed in a study published in the journal Nature on Thursday. The research was conducted by Showalter and Douglas Hamilton, an astronomy professor at the University of Maryland. “[Nix and Hydra] speed up and slow down, rock their north pole towards the planet and back again and maybe even reverse direction,” Hamilton said. Although Earth's moon orbits with a routine pattern, that predictability is non-existent for Nix and Hydra. “You would literally not know if the sun is coming up tomorrow...if you [had] real estate on the north pole of Nix, you might suddenly discover one day that you're on the south pole instead,” he said. But it's not music that gets the moons dancing. Instead, it's the imbalanced and constantly shifting gravitational field caused by Pluto and Charon. The pair's unusual gravity is due to the fact that the two act more like a binary pair than a moon and a planet. That is, they face each other and spin together around a fixed point, orbiting a common center of mass every 6.4 days. Charon's mass is about 11 percent of Pluto's. The outer moons of Styx, Nix and Hydra, which all have masses less than 0.001 percent of Pluto’s, take between 20 to 40 days to orbit the inner pair. The moons' irregular 'football' shapes also contribute to their chaotic orbits. However, despite their random rotations, the “resonant relationship” between the moons “prevents them from crashing into one another,” Hamilton said. Pluto's two remaining moons, Styx and Kerberos, are also believed to be drunkenly rotating, though further research is needed. The study involved images of the Pluto system taken by NASA's Hubble Space Telescope between 2005 and 2012. The first clues of chaos occurred when astronomers measured variations in the light reflected off Nix and Hydra. Images showed that brightness changed unpredictably, instead of following a regular cycle. The researchers are hoping to analyze the moons in more detail when NASA's New Horizons spacecraft passes by Pluto next month. It will beam back the first ever close-up pictures of the dwarf planet. "We've got pieces to start fitting together, and maybe eventually out of this we'll get a whole formation scenario for the [Pluto] system," Showalter said. Pluto's four outer moons were only recently discovered; Nix and Hydra were first observed in 2005, while Kerberos and Styx were first seen in 2011 and 2012, respectively.